to a more positive work environment for both practitioners and professional staff and, as a consequence, a much higher level of community satisfaction with our health care services. From January 2014 to 2015, 46 specialist outreach clinics and 9 lunch hour CMEs were held at Princeton General Hospital. This represents approximately 450 patient appointments in 11 specialty areas. Dr. Colleen Black began her practice at Cascade Medical Centre in August, 2013. She is presently the head of the Cascade Medical Group and has provided exceptional leadership to the entire team. Dr. Ella Monro joined Cascade Medical at the same time as Dr. Black and together they have formed a partnership characterized by cooperation, collaboration, initiative, and perseverance. NP Tanya Ter Keurs has been serving the Princeton community for seven years. Her experience and understanding of the community has provided the team with important continuity. As the community saw long serving doctors retire and many other doctors come and go, she has been an important key to our present day stability. Dorothy Westfall retired in April of this year after serving the Princeton community for over 30 years. As acting Patient Care Coordinator during the most critical months of the crisis, she provided expertise and leadership to the entire team. Cherie Whittaker joined Princeton General Hospital in September, 2004 as a member of the nursing staff. In 2009 she became the nursing manager of the hospital. Her contribution as an administrator provided stability through very challenging times. Erin Traverse joined the nursing staff at PGH in August 2013. She is the current Patient Care Coordinator at the hospital. Special mention is made of registered nurses Cathy MacDonald, Catherine Alexander, Michael Anne Miller, and Barb Nyman and licensed practical nurses Colleen Lueke, Kathleen Bedard, Michelle Nyland, and Trina Adams who were often the only source of emergency care when there were no doctors available to provide on call service. Michelle Leduc began work as a Medical Office Assistant at Cascade Medical in 2013 and was involved in the transfer of over 3000 patient records (on paper) from retiring doctors onto the MedAccess electronic medical record system at the clinic. Rachelle Sanderson joined Cascade Medical as an MOA in 2013 contributing to the professional stability being developing at the clinic. Laboratory Services personnel were important team members who provided 24/7 on-call service in addition to their regular duties. Lab technicians Gail Debnam, Sharon Elko, and Chris McMahon and Diagnostic Imaging technician Steve Ball deserve to be recognized for their contribution. It is also important to recognize the contribution made by Susan Brown, Health Service Administrator with Interior Health. She presently serves as the manager of the professional staff at the hospital and clinic and is co-chair of the Princeton Health Care Steering Committee. Her ongoing role as a facilitator and advisor provided the team with the support needed to see them through the darkest times. 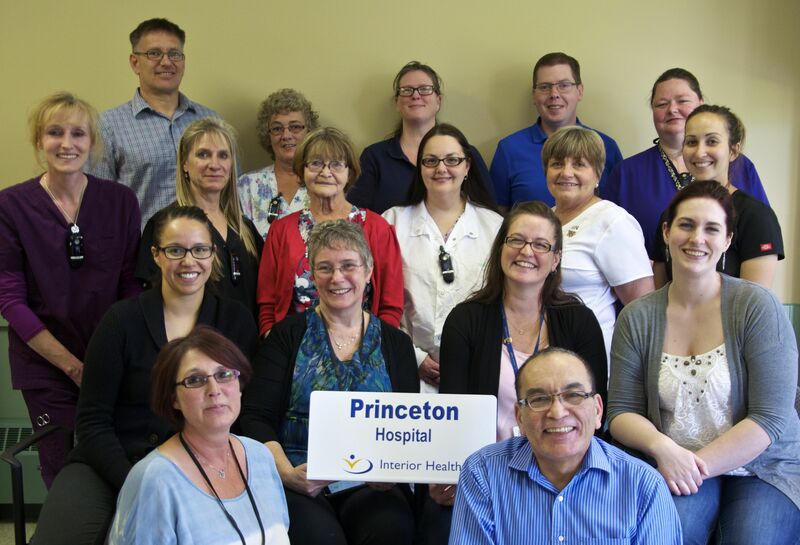 Due to the tireless efforts of the entire team at Cascade Medical and Princeton General Hospital, our community now enjoys a much improved and more stable health care model. The past four years have been very difficult and at times very stressful, especially for our healthcare practitioners and professional staff. Throughout this time, our health care team remained resolute in their commitment to provide the best possible service to our community and at the same time initiated many new programs aimed at improving access to services for all Princeton and Area residents. For this, we owe our team of health care professionals a great debt of gratitude. Well done and congratulations to these community-minded professionals. Recently here on the “Westshore” in the Greater Victoria area, we too have been having symposiums and discussions on how to attract medical doctors and other healthcare professional to our area. Our population is experiencing a very troubling shortage of doctors. How do we attract medical professionals to live and work in our communities? We have been looking at the “Primary Health Care” model and a website entitled “Fetch” (For Everything That Is Community Health) has been created to attempt to pull together information on available services. We are very interested in how your team accomplished its successful recruitment campaign.